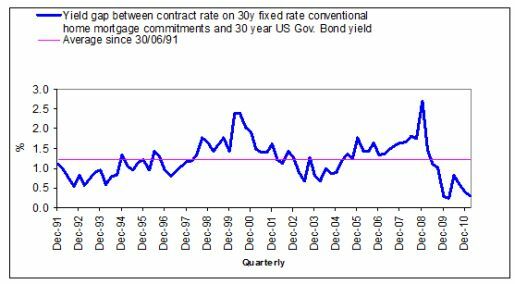 The chart below shows the difference in interest rates between a 30 year government bond and a 30 year mortgage. An investor purchasing a 30 year government bond this morning receives an interest payment every year of 4.76%. An investor purchasing a 30 year mortgage this morning receives an interest payment every year of 5.08%. The spread, or difference, is about .36%. How could this be? A government bond is considered risk free, where as I do not need to tell you the risk involved in purchasing a mortgage. You can just drive around and look at the foreclosure signs to see the investors who did not get their money back. The reason is because both bonds are essentially the same in the world we live in today. Our government guarantees, back-stops, or insures 99.5% of all new mortgages created today through the FHA, Fannie Mae, and Freddie Mac. Mortgage loans = government loans. Your local bank can issue mortgages with the comfort of knowing that if the government does not buy the loan immediately, they will insure against any losses with taxpayer money. Most view this as bullish for the housing market, their reasoning being that investors can lock in very low rates. That is a positive way to look at it. Readers of this site know that I believe the United States is moving toward a sovereign debt crisis. Our balance sheet is essentially a larger version of Greece, and in some ways it is actually worse. What has allowed us to postpone the pain has been our ability to finance the deficit with a printing press, which Greece was unable to do because they are a part of the European Union. I believe that some time in the next few years our government is going to have to decide what they can spend money on, and what they cannot. The reason is as our deficits continued to be monetised with printed money the cost of living will begin to surge. Interest rates on our government bonds will rise. If you believe we will have to cut spending, you need to decide which one you believe the government will take away from of these four. My bet is on the last one. I think the voters will choose to have food, medicine, and protection over living in an artificially high priced home that forces them to pay higher taxes and insurance every month on the artificially high paper price. If that outcome occurs, then mortgage rates will skyrocket. 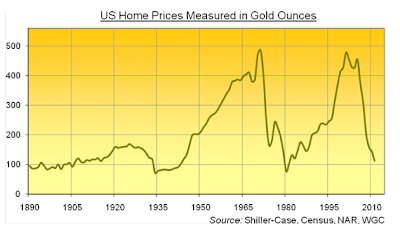 (If the government no longer guarantees the losses, banks will have to ask for higher down payments and higher interest rates to take on the risk) As rates rocket higher, home prices will have to fall in order for Americans to afford the mortgage payments and higher down payments. At this point real estate will be a tremendous investment opportunity. Patient investors can sell their precious metals and have a healthy down payment for performing rental property.